Mystic, Conn. (October 16, 2018) – Mystic Seaport Museum, in partnership with Tate, London, will host a major monographic exhibition devoted to the watercolors of one Britain’s greatest painters: J.M.W. Turner (1775-1851). Mystic Seaport Museum will be the only North American venue for J.M.W. 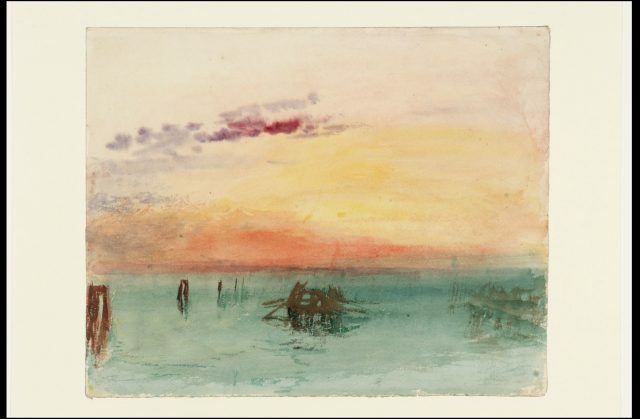 Turner: Watercolors from Tate, which will be on display October 5, 2019-February 23, 2020. The exhibition – curated by David Blayney Brown, Tate’s Manton Senior Curator of British Art 1790-1850 – will provide an exceptional opportunity to see key works spanning the entire career of the famous artist. A unique collection of about 90 works, the selection will provide a view into the evolution of the artist’s vision and creative process. The exhibition at the Museum – divided into six thematic sections – focuses on the critical role played by watercolors in defining Turner’s deeply personal style. The works have been selected from the vast legacy that comprises more than 30,000 works on paper, 300 oil paintings, and 280 sketchbooks, known as the “Turner Bequest,” donated to Great Britain after the artist’s death in 1851 and mostly conserved at Tate Britain. The bequest includes the entire body of works housed in the artist’s personal studio and produced over the years for his “own pleasure,” to cite the words used by the critic John Ruskin. While Turner is perhaps better known for his oil paintings, he was a lifelong watercolorist and fundamentally shaped what was understood to be possible within the medium during his lifetime and after. An inveterate traveler, Turner rarely left home without a rolled-up, loose-bound sketchbook, pencils, and a small traveling case of watercolors. These memories of journeys, emotions, and fragments of landscapes seen during his long stays abroad illustrate the development of Turner’s stylistic language focused on experimenting with the expressive potential of light and color. Deemed to be an extraordinary artist ever since his own time, Turner has had a profound and continuing influence on artists that continues to this day. The exhibition will be accompanied by a major new publication edited by Nicholas Bell, the Museum’s senior vice president for Curatorial Affairs. Titled Conversations with Turner: The Watercolors, the book will bring together scholars of Turner’s art from around the world to engage with each other about the force of his paintings and why they continue to serve as a touchstone for Western culture. Chubb, the global insurance company, in honor of Robert G. Stone, Jr.
Posted in Press Releases on October 16, 2018.